Mr. Ormsby, who generated the 2010 turnout figures that I cited to in the post below, suggested in a comment that I look at percentage turnouts in 2012 if I wanted to really compare to the turnouts he reported -- and it was a good point. Apples should be compared to apples, etc. I still suspect vote totals are the more important figure, since that determines the 'weighted vote' that committeemen use at slating time. Were primacy based on percentages of registered voters voting as opposed to total votes, back in the days when the first Mayor Daley used to quaintly refer to the suburbs as the 'county towns,' the Chairman of the Barrington Township Democratic Organization might have been the real primus inter pares: He might have turned out only a handful of voters, perhaps family members only, but if they all showed up on election day, he could boast 100% turnout. Were the numbers similar last week? As it turns out... some were... and some were very different. 3. Palm cards still work. Apparently. How's that for a bold beginning? Here, in this small turnout election, there seems to have been relatively little "dropoff" (compared to other years, with highly contested races at the top of the ballot); that is, most of the people who came out to vote in the Democratic Primary voted all the way down the ballot, including in all the many judicial races. That observation supports an inference that the voters who came to the polls knew what they intended to do before they left their homes. Therefore, one might suppose, palm cards would have little or no influence on these 'purpose' voters. But a look inside the numbers suggests that this may not be the case. In a comment to my post earlier this week, attorney Michael A. Strom suggested that the Tribune endorsements may have been the single most influential factor for many voters in the 8th Subcircuit (all the Tribune-endorsed candidates won their races there). Strom pointed out that Judge James L. Kaplan, a candidate for the 8th Subcircuit Cole vacancy (a race in which the area Democratic committeemen made no collective endorsement) was endorsed by the 48th Ward Democratic Party, and named on palm cards passed out by members of that organization -- and still finished behind Deputy Corporation Counsel John H. Ehrlich. But, while it is true that Ehrlich took 1,238 votes in the 48th Ward to Kaplan's 797, Kaplan's vote total in 48 was his second highest in any of the wards comprising the 8th Subcircuit -- supporting an inference, at least, that palm cards helped -- but didn't help enough. And there's more evidence supporting the continuing power of palm cards. I saw a number of references to a March 22 post on the Illinois Observer blog (now added to the sidebar), claiming that 33rd Ward Ald. and Committeeman Richard Mell decided to endorse Gregory Emmett Ahern, Jr. over Beatriz Santiago, the candidate slated by the area committeemen (and the winner of the primary), immediately before the primary. According to the 33rd ward source, Ahern put a precinct worker in every precinct, paying each $100 for the day and delivering each lunch. It worked. The workers ate Ahern’s lunch. I don't know who was on the palm cards, or if there were palm cards, in 32. But I know who was on the palm cards in my own 41st Ward. The card passed out on behalf of 41st Ward Democratic Committeeman Mary O'Connor and organization president (and State Sen.) John G. Mulroe, departed from the official party slate by encouraging votes for Judge James M. McGing for the Cahill vacancy on the Appellate Court and for Gerald V. Cleary for the Simmons, Jr. vacancy on the Circuit Court. Neither McGing nor Cleary won their races -- but they did very well in 41. Judge McGing garnered 1,988 votes in 41, comfortably ahead of officially-endorsed candidate Mathias W. Delort's 774. McGing got more votes in the 19th Ward (2,123) -- but there were over twice as many votes in 19 as in 41 in this race (9,914 to 4,403). In terms of percentage, McGing's best showing came in the 41st Ward. The numbers for Cleary were even better. While there were other wards in which he got more votes (19 again, for example), Cleary's best percentage showing came in 41, where he compiled 61.72% of the votes over officially endorsed candidate Cynthia Ramirez. I don't have palm cards from any other wards -- but there were other races in which some local influence seems to have been at work. In the race for the countywide Ward vacancy, for example, which featured three sitting judges among the six candidates, Judge Alfred M. Swanson, Jr. was the officially endorsed candidate of the county Democratic Party. Yet in the 19th Ward, Judge Peter J. Vilkelis, got 2,586 votes to Swanson's 1,188. (Elizabeth Mary Hayes, who won the primary, beat both Swanson and Vilkelis in 19 as well, gathering 2,939 votes there.) On the other hand, Vilkelis did have the Tribune endorsement. But if people were asked were to pick one ward in the City of Chicago where the Tribune endorsement would be least influential, the 13th Ward would probably be on most lists. Yet, in House Speaker Michael Madigan's 13th Ward, Vilkelis trounced all competitors, winning 3,586 votes (just over 3,000 more than Swanson, who had 578 votes; Hayes had 1,499 there). In the 14th Ward, Swanson managed only 237 votes (and Hayes 675), but Vilkelis got 974. Maybe the few voters who came out on March 20 weren't "controlled" by the Democratic Party or looking for food baskets or garbage cans, but they sure seem to have been "influenced" by the requests of their local political organizations. Once again, Tip O'Neill is proved right: All politics is local. The influence of palm cards presumably decreases as turnout increases -- but palm cards aren't obsolete yet. 4. I can never hope to make a living as a racetrack tout. I tried my hand at prognosticating in this election -- no, don't bother scrolling down looking for my predictions. I didn't publish them. But, before heading home on the 20th, I took my best, educated guesses about who would win the 27 contested Democratic primary judicial races. I didn't make guesses based on who I knew or liked personally. I tried to take my best shot at objectively predicting the winners. I got 15 of 27 right. Not only will I not be hanging around the track, I will not be going to Vegas anytime soon. The Circuit Court of Cook County has released the names of the 18 finalists for the nine current Associate Judge vacancies. Three current Circuit Court judges, serving pursuant to appointment by the Illinois Supreme Court, Mary S. Trew, Stanley L. Hill, and Nicholas Geanopolous, are among the 18 finalists. All three lost bids to win election to full circuit judgeships in the March 20 primary. Also making the "short list," according to Pat Milhizer's story this evening in the Chicago Daily Law Bulletin (subscription required) are Assistant State's Attorneys Thomas F. Biesty, Joseph M. Cataldo and Catherine D. Sanders. Biesty ran for judge from the 10th Subcircuit in 2008. Also on the list are Assistant Public Defenders Lester W. Finkle, Lana C. Johnson, Alfredo Maldonado and Vicki F. Rogers and Assistant Attorney General Richard D. Schwind. Chicago Transit Authority general counsel Karen G. Seimetz is also a finalist, as are Allen P. Walker, a partner at Greene and Letts; Rossana P. Fernandez (left), a partner at Sanchez, Daniels & Hoffman LLP; and solo practitioners Steven Mark Wagner, Denise Y. Staniec, Lori G. Levin, Michael J. Kane. Levin and Schwind were also finalists for Associate Judge in 2009. Not everyone else in the 239-person applicant pool was sent away disappointed. By my count, at least nine others in the pool are presumptive winners in November as a result of winning their races in last week's primary. That does not count Judge Andrea M. Schleifer or attorney Edward M. Maloney, both of whom won their respective primary races but face Republican opponents in the fall. Maloney's opponent, Christine Cook, was also in the applicant pool. Two of these three will also be Circuit Court judges come December 3. On the other hand, while three current judges did make the "short list," at least nine currently sitting judges in the applicant pool were passed over, as were at least three others who have previously served on the bench, but who are not working as judges presently. One other aspirant who failed to make the "short list" is named at the bottom of this post. Here's two lessons I think we can draw from last week's primary; more to come later in the week. 1. Advertising works -- but only when there's enough of it. Conventional wisdom held that Supreme Court Justice Mary Jane Theis's decades of judicial experience might not matter in light of Appellate Court Justice Aurelia Pucinski's name recognition. So Justice Theis raised money, and lots of it, and bought time on every evening TV newscast. I usually watch the news at 9:00 and 10:00 -- so I, for one, was doubly grateful when Justice Theis premiered a new commercial in the waning days of the campaign. 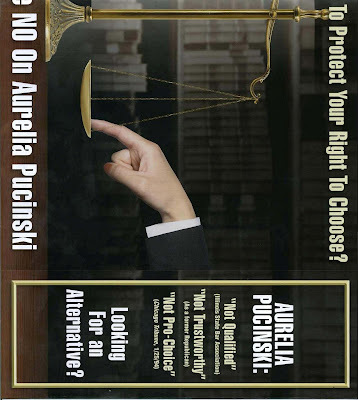 Theis's margin of victory over Pucinski and Appellate Court Justice Joy V. Cunningham suggests that the ad buys were a vital component of her victory strategy. The advertising employed by Judge Kevin W. Horan and Associate Judge Joan Marie Kubalanza, though noteworthy (and, in my opinion, pretty darn cool), was not nearly as successful. 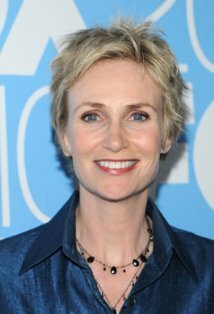 Jane Lynch, star of the Fox-TV show Glee, made a commercial for Judge Horan; "Da Coach" himself, the Right Hon. 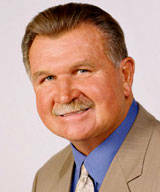 Mike Ditka, made a commercial for Judge Kubalanza. These were not 'paid celebrity endorsements.' As the very nice write-up in the Sun-Times (now off-line) explained, there were personal or family connections in both cases. But the airwaves were not saturated with either Ms. Lynch or "Da Coach." I can recall hearing Judge Horan's commercial only once. I heard Judge Kubalanza's only a couple of times, both times on a Sunday morning on WBBM-AM. The cost of weekend radio airtime is lower than TV airtime on the flagship newscasts of Channels 5 or 9 -- but the audience is smaller, too. Without constant... constant... constant repetition, even clever commercials fail to penetrate the public consciousness. 2. Turnout is all important. A total of 311,002 voters came to the polls in the City of Chicago on March 20 (311,002 out of 1,288,293 registered voters). In the Cook County suburbs, 329,193 voters came out (of 1,394,649 registered voters). Thus, of 2,682,942 registered voters in Cook County as a whole, only 640,196 – 23.9% of us – participated in the primary election. Most Cook County voters – 436,899 if you're counting – took Democratic primary ballots. Columnist Russ Stewart correctly predicted a Democratic primary turnout of "less than 500,000, with fewer than 150,000 blacks voting, fewer than 50,000 Hispanics, and about 300,000 whites. That means that a majority of the turnout will be 'controlled' voters." Stewart defined "controlled" voters as "quid pro quo voters who have a personal interest in the outcome. Either they or a family member have a government job, or they need to pay back a precinct captain or politician for some favor, or they're ambitious and want to curry favor. Reciprocity is the name of the game. Controlled voters number about 350,000 countywide." Whether one accepts this definition or not, the conventional wisdom is that low turnout elections are best for slated candidates. That principle certainly held up in this election: There were 27 contested judicial elections on the March 20 Democratic primary ballot. I was able to verify slating in 24 of them. (There was no slated candidate for the Cole vacancy in the 8th Subcircuit; although I could make an educated guess, I don’t know for certain who the slated candidates were in contested 7th Subcircuit races.) There were three countywide Circuit Court elections in which the party-slated candidates did not prevail. Of those three countywide races where the party-slated candidate did not prevail, two were won by women with Irish surnames (one of them a Filipino-American); the other was won by a woman with an English surname. In that last race, the second most crowded field among the countywide races, there were three sitting judges to divide up the vote (Judge Kubalanza was one of these). While Elizabeth Mary Hayes, the victor in that race, was rated "Qualified" by only the Asian American Bar Association, the Hispanic Lawyers Association of Illinois, and the Puerto Rican Bar Association, the other two non-slated winners, Karen Lynn O'Malley and Jessica A. O'Brien, were rated Qualified or Recommended by the Chicago Bar Association and every one of the 11 Alliance bar associations. But those are details. The big picture is that, despite these three losses in countywide Circuit Court races, candidates slated by the Cook County Democratic Party won 20 of the 24 elections in which I could determine slating. (The other race in which the slated candidate failed to prevail was in the 9th Subcircuit - Epstein vacancy.) In this year's small-turnout race, slated candidates won 83% of the time. Following is a list of the winners in yesterday's Cook County judicial primaries. This list is based on figures published overnight by the City of Chicago Board of Election Commissioners and Cook County Clerk David Orr's office. Appellate Court - Coleman vacancy (uncontested) - Nathaniel Roosevelt Howse, Jr.
Appellate Court - Gallagher vacancy - P. Scott Neville, Jr.
Lewis leads Judge Arthur P. Wheatley, according to the combined unofficial figures published overnight by the City of Chicago Board of Election Commissioners and the Cook County Clerk's Office, by a total of 331 votes. This race was awfully close when I last looked at it yesterday evening. Judge Laura Marie Sullivan appears to have finished third with 64,111 votes; Mary Brigid Hayes appears to have finished fourth with 56,852 votes. Also in the race were Judges James Michael McGing and Kay Marie Hanlon. Delort's margin of victory came in the suburbs, where he out-polled Judge Hill-Veal by 16,000 votes. Judge Michael R. Clancy, appointed by the Illinois Supreme Court to the O'Brien vacancy in the 11th Subcircuit, will keep his seat. He fended off a strong challenge from Maureen A. Murphy, Senior Counsel for the Archdiocese of Chicago, garnering 9,193 votes to Murphy's 8,244. These are not official figures, but the City is reporting only one of 146 precincts still uncounted and the County Clerk advises that all 123 suburban precincts of the 11th Subcircuit have been counted. Maritza Martinez and Roger Zamparo were also in this race. Lisa Ann Marino got strong numbers in the City of Chicago, giving her an insurmountable lead over nearest challenger Pamela McLean Meyerson, 12,879 votes to 6,845 in the unofficial combined totals. Deborah J. Fortier and Jennifer A. Blanc were also in this race. Clancy and Marino were the candidates slated by local Democratic Party officials. Judge Andrea M. Schleifer was the decisive winner in the race for the Democratic nomination in the 12th Subcircuit's Rochford vacancy. This is the seat to which Schleifer was appointed by the Illinois Supreme Court. Schleifer had 8,308 votes at last count (with 249 of 252 precincts reporting), safely ahead of her nearest challenger, Michael John Halloran. Schleifer will face Republican James Paul Pieczonka in November. Terry Gallagher beat two judges to win the Democratic nomination for the Riley vacancy in the 4th Subcircuit. With all but one (248 of 249) precinct counted, Gallagher has 5,635 votes, ahead of Judge Daniel Lawrence Peters (3,719 votes) and Associate Judge William "Gomo" Gomolinski (3,827 votes). Joanne Marie Rogers appears to have finished second in this race with 4,257 votes. Judge Peters was appointed by the Illinois Supreme Court to the 'A' vacancy in the 4th Subcircuit but filed for this vacancy instead. In the race for the 'A' vacancy, Edward M. Maloney won the Democratic nomination with 6,761 votes. Karin Elizabeth Swanson finished second with 5,304 votes. Gallagher will face Republican Harry J. Fournier in November; Maloney will face Republican Christine Cook. Judge Maureen Leahy Delehanty, who was most recently appointed by the Illinois Supreme Court to the McGann vacancy in the 3rd Subcircuit, defeated Scott Edward Lipinski this evening. With 75 of 76 suburban precincts reporting, and every City precinct accounted for, Delehanty leads Lipinski, 23,924 to 10,946. The Illinois Supreme Court appointed Arthur P. Wheatley to this vacancy, but Judge Wheatley is in an extremely tight race at this hour in his bid to hold onto this seat. There are now only three City precincts outstanding, and only two suburban ones uncounted and Judge Wheatley is down 311 votes to challenger Kimberly D. Lewis. Judge Wheatley was rated Qualified or Recommended by every bar association. Wheatley had the endorsements of the Chicago Tribune, the Chicago Federation of Labor, the IVI-IPO, the Illinois Committee for Honest Government, and the Chicago Defender. Lewis has been an Illinois attorney since 2001 and has served as a hearing officer for the City of Chicago. She refused to participate in the screening process. Lewis leads, at this hour, 7,699 to 7,388. Mable Taylor is in third place in this race, with 5,884 votes to this point. Judge Tommy Brewer appears to have held on to the seat to which he was appointed by the Illinois Supreme Court. In the race for the Starks vacancy in the 7th Subcircuit, with only two suburban precincts unaccounted for (55 of 57) and only four City precincts still outstanding (230 out of 234), Brewer is ahead of challenger Roxanne L. Rochester, 13,323 to 9,470. The Toney vacancy, though, is shaping up as a real cliffhanger. More momentarily. About 98% of the vote has been counted in both the City and suburbs to this point. In the race for the countywide O'Mara Frossard vacancy, two judges were again pitted head to head. Judge Kevin W. Horan had been appointed to the 4th Subcircuit Riley vacancy, but he filed for the O'Mara Frossard vacancy, setting up a contest with Judge Diann Karen Marsalek. Marsalek was appointed to, and slated for, this vacancy. And it appears that Marsalek has succeeded in holding this seat. She has a nearly 20,000 vote cushion over her nearest challenger, Nichole C. Patton (115,549 to 95,838). Judge Horan has 82,589 votes at last count. Cynthia Ramirez has bested Gerald V. Cleary in the race for the countywide O'Brien, Jr., 204,983 votes to 124,000. Ramirez was the party-slated candidate here. In the race for the Kinnaird vacancy, Judge Erica L. Reddick has apparently defeated Kevin Cunningham, garnering 183,748 votes (at this count) to Cunningham's 149,697. Judge Reddick was appointed to this vacancy by the Illinois Supreme Court and slated by the Cook County Democratic Party. Another appointed judge is not faring as well in the race for the countywide Conlon vacancy. 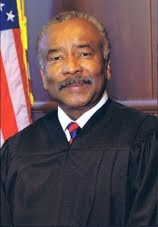 Judge Stanley L. Hill, Sr. was appointed to this vacancy by the Illinois Supreme Court and slated by the Cook County Democratic Party, but, at this point, he trails Karen Lynn O'Malley by just under 5,000 votes, 149,570 to 144,717. Judge Hill had a roughly 7,300 lead coming out of the City, but O'Malley is leading in the latest suburban totals 65,022 to 52,873. 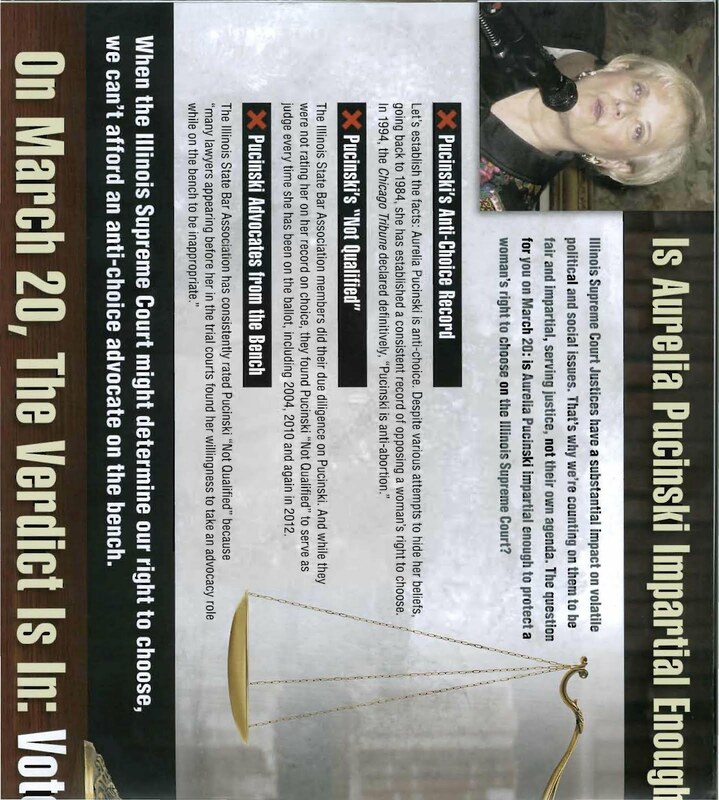 Judge Pamela M. Leeming was appointed to the bench by the Illinois Supreme Court in late 2009. She ran in a very crowded 11th Subcircuit field in the 2010 primary but was unsuccessful. She was subsequently recalled to judicial service by the Illinois Supreme Court and slated by the Cook County Democratic Party for the countywide Stewart vacancy. Judge Leeming will hold this seat. With nearly 98% of the City vote and 97% of the suburban vote, Judge Leeming has 118,165 votes. Her nearest challenger in this seven person field is Mary Margaret Burke, with 73,671 votes. There was no sitting judge in the race for the countywide Simmons, Jr. vacancy. The slated candidate was Michael A. Forti, but he appears to have fallen tonight to Jessica A. O'Brien. O'Brien has polled 147,697 votes to Forti's 100,358 votes. A third candidate in this race, James A. Wright, has 84,977 votes. 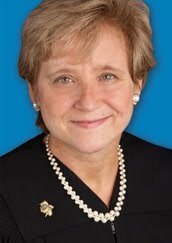 Judge Lorna Ellen Propes, who was appointed by the Illinois Supreme Court to a 7th Subcircuit vacancy but was slated by the Cook County Democratic Party for the countywide Pucinski vacancy, is the apparent winner of Edward J. Maloney, leading at this point with 172,767 votes to Maloney's 154,245. There were three sitting judges competing for votes in the race for the countywide Ward vacancy, Judge Alfred W. Swanson, Jr., who was appointed to this vacancy by the Illinois Supreme Court and slated by the Cook County Democratic Party; Judge Peter J. Vilkelis, who was appointed by the Illinois Supreme Court to the countywide O'Brien, Jr. vacancy but was passed over at slating time; and Associate Judge Joan Marie Kubalanza. All three jurists will apparently finish behind Assistant Public Defender Elizabeth Mary Hayes. With 95.61% of the City vote counted and 97% of the suburban vote in, Hayes leads the crowded field with 96,186 votes. With these numbers, she seems to be the apparent winner over Swanson, with 79,964 votes. Vilkelis has 44,728 votes and Kubalanza 30,906. With 89.5% of the City precincts reporting and 97% of the suburban vote counted, Associate Judge Larry G. Axelrood has a narrow lead, with 8,841 votes, just about 700 votes ahead of Abbey Fishman Romanek (with 8,118 votes). Judge Mary S. Trew, who was appointed to this seat by the Illinois Supreme Court, has 5,756 votes to this point. Two sitting judges were pitted against one another for the Bender vacancy in the north side/north suburban 9th Subcircuit, Lionel Jean-Baptiste and Michael Ian Bender. With 89.5% of the City precincts reporting and 97% of the suburban vote counted, Judge Jean-Baptiste leads Judge Bender, 14,795 to 9,735. With 127 of 152 City precincts counted, and 113 of 136 county precincts counted, Carl B. Boyd has 15,875 votes, comfortably ahead of his nearest challenger, Arthur Wesley "Wes" Willis (5,934 votes). Appellate Court Justice P. Scott Neville, Jr. holds a substantial lead at this point, with 82% of the suburban vote and 84.42% of the City vote counted, with 132,546 votes, a 30,000 vote cushion over his nearest competitor, Associate Judge Marguerite Anne Quinn (100,075 votes). With 82% of suburban precincts and 84.42% of City precincts reporting, Circuit Court Judge Jesse G. Reyes has 100,134 votes, over 22,000 votes ahead of his nearest competitor, Associate Judge William Stewart Boyd (77,688 votes). Judge Ellen L. Flannigan has 67,524 votes. Appellate Court Justice Rodolfo (Rudy) Garcia, who was fighting to hold this seat after being passed over for party slating, has 38,179 to this point. Supreme Court Justice Mary Jane Theis has 155,331 in the latest numbers from both the City and the County, well ahead of Appellate Court Justices Joy Virginia Cunningham (71,791 votes) and Aurelia Pucinski (68,283 votes). These combined numbers are with 82% of suburban precincts counted and 80.46% of the City precincts included. The Illinois Supreme Court appointed Ketki "Kay" Steffen to the 'A' vacancy in the far northwest suburban 13th Subcircuit in early 2010. Judge Steffen subsequently filed for the Pietrucha vacancy in that subcircuit. Tonight, with 181 of 231 precincts reporting, it appears that Paul S. Pavlus is going to defeat Judge Steffen in the race for the Pietrucha vacancy. He leads Steffen 8,478 votes to 4,670. Martin C. Kelley was unopposed in his bid for the 13th Subcircuit 'A' vacancy. The County Clerk's office is not yet posting numbers in this race. Seventy-three percent of the City precincts have been counted so far. More as the evening develops. On Tuesday, voters requesting a Republican primary ballot in Cook County will discover that they have largely forfeited their right to vote for judges. (Republicans are certain to be elected only from the far northwest suburban 13th Subcircuit, and only one of the two subcircuit races on the ballot there are contested.) No Republican bothered to even file for any of the 11 countywide vacancies on the Circuit Court or the six vacancies on the Appellate Court; in all but three subcircuit races (two in the 4th and one in the 12th) and in the race for the Supreme Court, the winners of Tuesday's Democratic Primary elections are virtually assured of taking office in December. 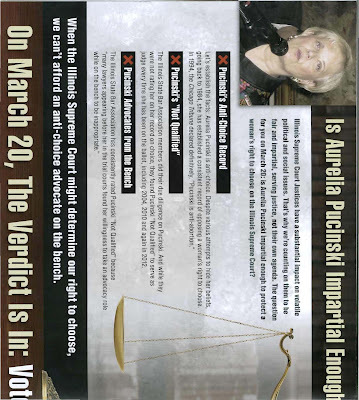 In Friday's ICJL Newsletter, Illinois Civil Justice League President Ed Murnane acknowledged, "As a Cook County resident voting in a Republican Primary, I must say it's startling to look at the Cook County ballot and see all these 'No Candidate' listings next to all the judicial contests." On the other hand, Murnane wrote, "it's no better to see blanks on the Democrat primary ballot in other jurisdictions. It's just more impressive -- and depressing -- in Cook County where we elect half the judges in Illinois." Murnane and the ICJL want reform of the election process. In Cook County, most discussions of "reform" of the judicial election process involve elimination of elections altogether. The untrustworthy decisions of an ignorant electorate should be replaced by a system of "merit selection." The Sun-Times editorialized in favor of merit selection just this week (my response, and a link to the newspaper's editorial, may be found here). A mandatory standard for service as an attorney must be a qualification. Five years? Ten years? That can be decided. Candidates for the judiciary should be screened by a bi-partisan review commission before they have their names included on the ballot. The bi-partisan commission should include eight members in each of the legal jurisdictions in Illinois. That would include five Supreme/Appellate Court districts and the 22 Circuit Court districts. Cook County, because of its size, could be treated in a similar fashion but perhaps with multiple commissions. The eight members would include two each appointed by the four legislative leaders (Senate President, House Speaker, Senate Minority Leader, House Minority Leader). One of the two members appointed to the commission by each legislative leader must be an attorney, the other would not. That would assure an eight-member commission with four attorneys and four non attorneys; and four Republicans and four Democrats. In order to be recommended by the commission, a prospective candidate must win approval of six of the eight members. That means Republicans and Democrats, lawyers and non-lawyers, would approve the candidate. Candidates for commission support would be interviewed by the commission, in addition to meeting other requirements to be determined by the commission. As many as four candidates for each position could be approved by the commission. Those four would run in a non-partisan primary election and the two highest vote getters would run in the general election. Candidates who were selected by the commission would be designated as such on a non-partisan judicial ballot, in much the same way as local referenda appear on primary and general election ballots. Candidates not selected by the commission could run but without the designation of "commission backed." Murnane told FWIW in an email that he saw the commission as a way of making the proposal more politically viable. "Hopefully," Murnane wrote, "it will make it balanced too. If they were to cut deals, it destroys the balance." But there are a number of questions that arise from empowering legislative leaders, or their designates, to decide who is -- or who is not -- "backed" for the judicial ballot. Would these positions be paid? If paid, might they then be pension eligible? And paid or not, how does one avoid the appearance of unfairness when Commission Member Smith subsequently appears in front of a judge that he or she has stamped with his or her seal of approval? Should we expect -- or require -- a judge to recuse him- or herself from any case brought by a commission member for a period of time -- 3 years perhaps? (I'm wondering if Supreme Court Rule 63C could or would have to be modified to address these commissions, Rules 63C(1)(a) or (c) in particular.) Murnane acknowledged that recusal rules would have to be adopted, although he sees the particulars of this as a matter for the General Assembly to address. The ICJL proposal suggests that the General Assembly should determine how long any commission member might serve. Limits would be placed on expenditures by candidates in judicial elections. Public funding would be provided to candidates approved by the commissions and they could spend no more. Candidates who were not approved by the commission, but chose to run, would be limited to receive and spend no more than commission-backed candidates. Under the ICJL proposal, judges elected pursuant to this new system would face retention elections, just as judges do now. Perhaps the real significance of the ICJL's proposal is that it is further evidence of a growing consensus, along the entire political spectrum, that significant reform of the judicial election process is necessary. What do you think of the ICJL proposal? What reforms would you propose? "Personal and political PACs (Political Action Committees) have no place in judicial elections and their recent entry in the Illinois Supreme Court election further erodes public confidence in the independence of our judiciary," according to Chicago Bar Association President Robert A. Clifford. In a statement released by the CBA yesterday, Clifford stated, "There is good reason why the Constitution separates the Judicial from the Executive and Legislative Branches of our government. Public confidence in the independence of our court system is paramount and PACs by their very nature are politically motivated and agenda-specific which tend to undermine that confidence." Almost simultaneously, as Capitol Fax reported Wednesday, one of Personal PAC's "independent expenditures" began hitting mailboxes. Clifford said the U.S. Supreme Court’s decisions in Caperton v. Massey and Citizens United v. Federal Election Commission have "opened a 'dark door' for the 39 states that elect judges." Clifford likened the developing case law to "Lewis Carroll’s proverbial never ending spiraling rabbit hole the consequences of which will inevitably make our judicial elections more negative and further blur the lines of judicial independence." In the wake of these Supreme Court decisions, Clifford said, the American Bar Association is urging states to enact more stringent rules for judicial recusal and disclosure requirements for spending on judicial races both for direct campaign contributions and indirect support. In his statement, Clifford specifically called on judicial candidates to reject the use of personal and political agenda-specific PACs in their campaigns. Contacted for a reaction, Brendan O'Sullivan, speaking for the Theis campaign, told FWIW in an email, "Since Personal PAC is running an Independent Expenditure, we have had no coordination with them, and first saw the mailers on the Capitol Fax blog." 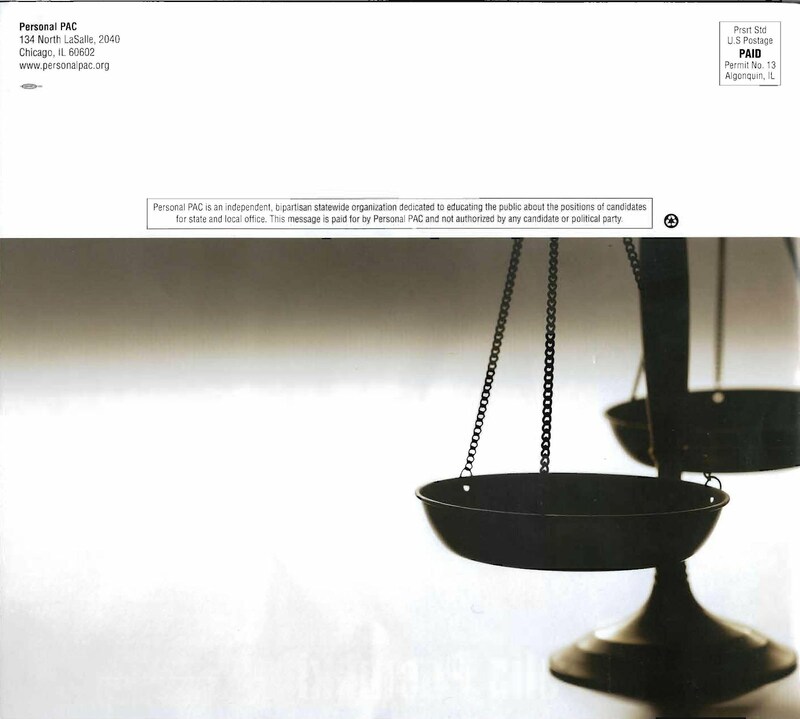 The campaign had no comment on Clifford's call to reject PAC money in judicial campaigns. 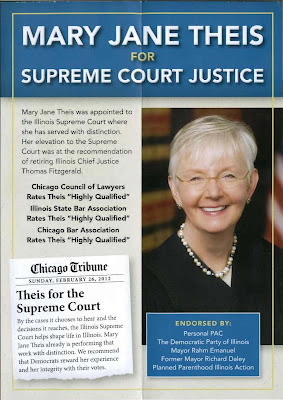 However, according to a March 16 article by Jeff Coen, Justice Theis told the Chicago Tribune that "she did seek the endorsement of the group, but was careful to tell the organization she would not comment on any issue that could wind up before the court, such as parental notification of abortion." At this point, Personal PAC may be the only political action committee actively participating in the primary process. In an email interview with FWIW, Ed Murnane, President of the Illinois Civil Justice League, expressed general agreement with Mr. Clifford's position. "I'm not sure I agree on [Clifford's] 'dark door' theory but we definitely need to make some changes" in the judicial election process. Murnane confirmed that JUSTPAC, the ICJL's political action committee "has not put any money into any judicial campaigns this year." He added, however, that ICJL and JUSTPAC "have not ruled out supporting candidates in the General Election." More about ICJL's suggestions for the reform of Illinois judicial elections tomorrow. The Organizing the Data posts have been updated accordingly. A comment received overnight advised that James C. Murray had withdrawn from the race for the Rochford vacancy. A check of the Illinois State Board of Elections website this morning confirms that Murray withdrew his candidacy on March 2. The Illinois State Board of Elections website also confirms that Kent A. Delgado has withdrawn his bid for the Delgado vacancy in the 6th Subcircuit. According to the ISBE, Delgado withdrew his candidacy on March 14. The corresponding Organizing the Data posts have been updated accordingly. Bumped up for greater visibility 3/17/12. Here is where FWIW organizes all the data -- links to the websites, the video appearances, all the evaluations, all the endorsements -- so you, the voter, can make the most informed choices possible when you vote. 14th Subcircuit - O'Gara vacancy (uncontested). Notes: Some of these links will take you to page two, so you will not see all of the linked posts if you merely scroll down this page. Individual "Organizing the Data" posts will be updated as necessary right up until the March 20 primary. They will bear the date on which they were first posted, but I will add the latest update date at the top of each post so you will know when it was last changed. The Illinois Civil Justice League announced its Cook County Circuit Court endorsements in its newsletter this morning. In the race for the Kinnaird vacancy, the ICJL endorses Kevin Cunningham, calling his "thoughts on shrinking frivolous lawsuit filings... insightful and specific." The ICJL endorsed Gerald V. Cleary for the O'Brien vacancy, citing, in part, Cleary's views "on necessary reforms for judicial selection, including greater transparency in the selection of associate judges." For the Pucinski vacancy, the ICJL picks Edward J. Maloney, saying has an "impressive resume, is involved in his community, and is immensely qualified to be a judge." The ICJL took a pass on the race for the O'Mara Frossard vacancy, choosing not to decide between Kevin W. Horan and Diann Karen Marsalek. "Both are worthy candidates," the ICJL stated, "seem to be good judges, and would otherwise have received our support individually," adding that "voters have good choices in this race." The ICJL's endorsements have been added to the appropriate Organizing the Data posts. For a post regarding ICJL's comments on the Supreme and Appellate Court races, click here. FWIW has acquired what it believes to be a copy of the list of endorsements made by the Chicago Fire Fighters Union, Local 2 for the March 20 primary. As you'll note from the list that follows, in several races the Firefighters decided to recommend more than one candidate. In the race for the countywide vacancy, the Fire Fighters recommended three hopefuls, Alfred M. Swanson, Jr., Elizabeth Mary Hayes, and Joan Marie Kubulanza. It is my understanding, based on communications with candidates or their representatives, that Local 2's endorsements were released over a period of time, from mid-January to mid-February. The membership was apparently notified of the union's endorsements and recommendations on or about February 21, in time for the start of early voting. By that time, Daniel R. Degan was unopposed in his bid for the Moore vacancy in the 3rd Subcircuit. Nevertheless, Local 2 recommended both Degnan and Thomas J. Carroll (who withdrew on January 17). A list of Local 2's judicial endorsements and recommendations in contested judicial races follows; these have also been added to the Organizing the Data posts.